The Allis family were important members of the 18th Century Bolton Community. Nathaniel was one of the earliest settlers and 50 original Proprietors. His son David built early saw and grist mills on the Tankerhoosen River and was also a central figure in establishing the North Bolton Parish. This is their story. William Allis came from England to America in 1630 as a young man and established himself as a surveyor near Braintree, MA. In 1658 he emigrated to Wethersfield and 3 years later moved to Hadley, MA over a dispute with the church. His oldest son John, from whom Bolton's Allis family descends, was born in Braintree in 1642. 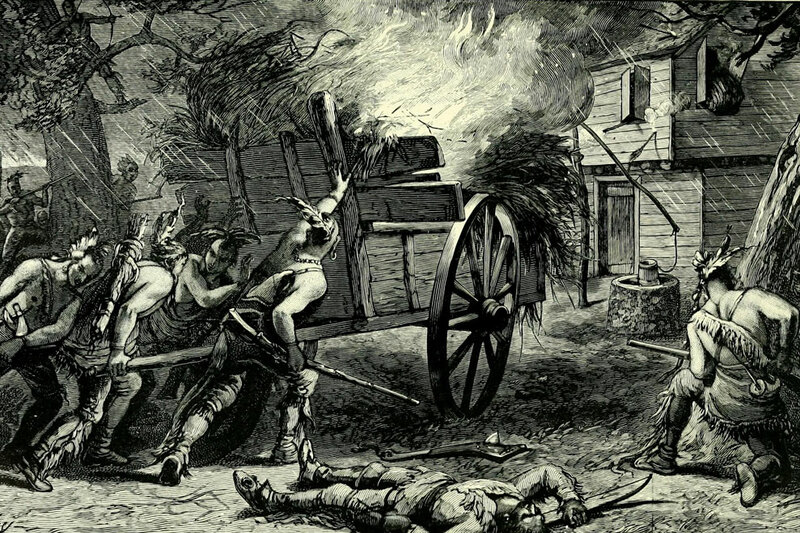 Hadley and Deerfield were the frontier in 1675 and William and his sons, including John, were officers during King Phillip's War when Hadley was attacked in 1675 and 1676. The war was the greatest calamity to occur in 17th Century New England and is considered by many to be the deadliest war in the history of American colonization. William was a Captain at the Battle of Great Falls where his son William, Jr was killed. In 1677 Indians from Canada again raided when the men were away and burned the village, killed 12 and captured 17 taking them to Canada. William's wife Mary was killed and John's daughter Abigail taken captive. The prisoners were turned over to the French and later returned. The family suffered additional tragedy in 1704 when the French and Indians attacked Deerfield and John's sister-in-law was killed and 2 nieces captured. John's youngest son Nathaniel was born in Hatfield in 1685. As his father and grandfather were leading citizens he must have grown up with the stories of recent Indian raids and the possibility of future threats. Nathaniel was born to John in Hatfield in 1685, John's 11th child. He moved to Connecticut and married Mercy Dudley of Guilford in 1703 at the age of 18. They then settled in Bolton about 1705. A number of young men from the Deerfield and Hadley area moved to Coventry and Bolton, probably for a safer place to farm and raise their families. Nathaniel was one of Bolton's earliest settlers, about 15 years before Bolton was incorporated, and as such was one of the original 50 proprietors. He and Mercy had 12 children in Bolton. Their first child Mindful born in February 1, 1708, died April 15, 1708; the first recorded death in Bolton. Bolton was incorporated by the Connecticut General Court in 1720 and the inhabitants charged with dividing and improving the land. Each of the 50 proprietors, some living in town and others absentee landlords, were granted 100 acres for their Homelot in what was known as the First Division. There is no record of how the lots were distributed in Bolton but a common practice was to draw a grid on a map, number the plots and draw lots. The original map is missing, but an attempt was made to recreate the map and lot distribution for the bicentennial in 1920. Nathaniel's initial Homelot was located below Bolton Center on the east side of town. Upon receiving this property in 1723 Nathaniel immediately exchanged it with another Proprietor for a 100 acre lot on today's Bolton/Vernon town line on the Great Swamp (Bolton Lake). This may have been where he was homesteading for the previous 15 years and by agreement exchanged the lots. Over the next 80 years there will a total of 12 Divisions, most smaller than the previous Division, and Nathaniel and his heir David will receive land from Divisions 3, 5, 6 and 7 - a total of 50 acres, all in North Bolton. After Nathaniel's wife Mercy, the mother of his 12 children, died in 1731, he took Elizabeth as his second wife. He was a prominent member of the community and church and died in 1751 at the age of 66. He is buried in the Quarryville Cemetery. 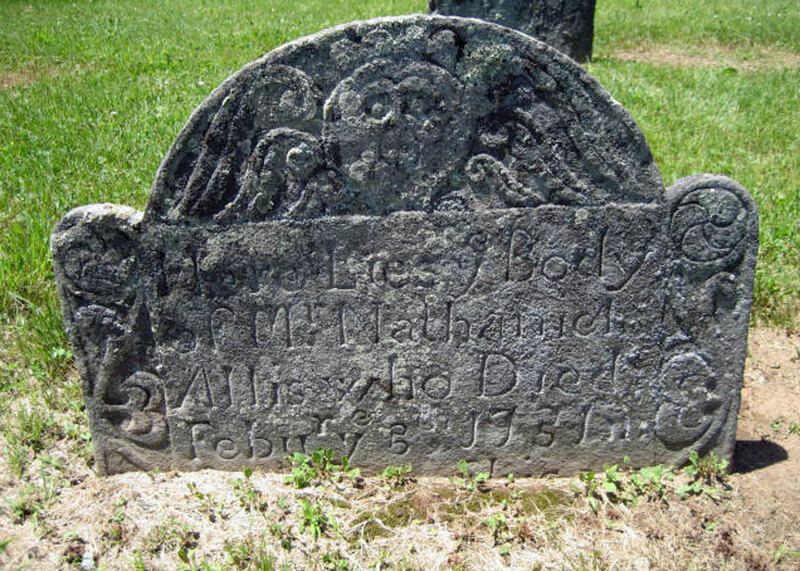 The North Bolton Cemetery was created the same year, but Nathaniel was likely buried with Mercy. Nathaniel left a will with an inventory of his property. At the time inventories were very detailed listing items of furniture, clothing and tools. Other than the 100 acre Homestead he retained only two 15 acres parcels on the Tankerhoosen Brook at the time of his death. As all of his other sons had moved from Bolton David was his sole executor and heir, charged with taking care of Elizabeth and paying the legacies left to his nine living children. David sold Nathaniel's Homelot in 1757. At Nathaniel's death David was 31 having been married for 11 years. He had his own farm and the mills a few miles north of his father. His step mother Elizabeth lived with him for 23 years until her death in 1774. Born in 1720 David grew up on his father's farm on the Bolton-Vernon line. He married Sarah Pendal of Bolton in 1741 when he was 21 and began buying land in North Bolton for his own farm and business. He apparently planned early to become a miller as the mill lots on the Tankerhoosen River were laid out in 1743 and he paid a tax on the land. Once operating mills were no longer taxed. In 1744 he purchased from his older brother Jonathan 10 acres north of the Tankerhoosen Brook across Reservoir Road from the mills. About this time the town laid out highways across his property, likely Baker Road connecting his mills to the center of town. » Read about the Allis Mills. Besides his father's land David also inherited the right to further land divisions. He received the smaller 9th and 10th Divisions in 1754 and 1762, only a total of 14 acres but they were located north of Baker and west of the mills thus adding to his property. David bought and sold many parcels between 1744 and 1763. The population of North Bolton grew and the 5-7 mile journey to the meeting house each Sunday for church services became more of a burden on families. The Colonial government was petitioned for a new parish and finally in 1762 this was granted. David was one of the leaders in this effort as his house was used for planning meetings, he was a signature to letters, and his home was used for church services for a year until the new meeting house could be constructed. David was also instrumental in hiring Rev. Ebenezer Kellogg, our first minister, who came to the parish in 1762. He sold Kellogg four parcels along Bamforth Road near the meeting house where Kellogg built his house and had his farm. Because of his role in the church and historians lack of knowledge of his mills there have been misunderstandings about the location of David's house was located. Visit this page for a discussion on the location of his house. » The site of David's house is controversial. Read our conclusion. During the Revolutionary War period Allis was very active in town affairs. As Bolton was located at the junction of key roads from Boston and Providence leading into the Hartford area troops, statesmen and military leaders passed through with many stopping overnight or for a meal. These included Washington, Lafayette, Rochambeau and Franklin. Of particular note Rochambeau's troops in 1781 camped in Bolton on their way to Yorktown. We have primarily town records to inform us, but David at 55 years old in 1775 didn't fight in the war but played many other roles. At various times over the next decade he was a grand juryman, town surveyor, collector of highway taxes, selectman and fence viewer. He was also elected to the important position of Town Meeting Moderator every year from 1777 to 1783. 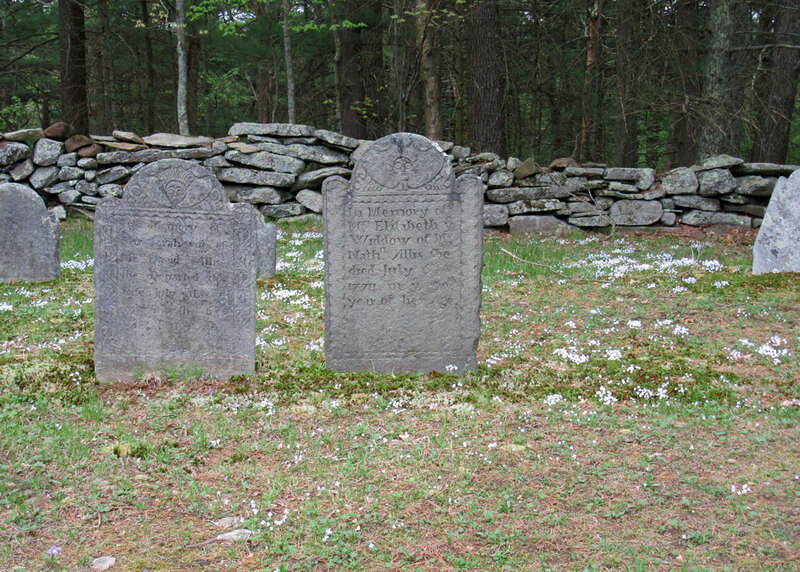 In 1780 David's wife Sarah died and was buried with his stepmother in the Old North Bolton Burying Ground. Three years later in 1783, at age 63, he married Heziah Dewey. In his last years David seems to be attempting to wind up his affairs. 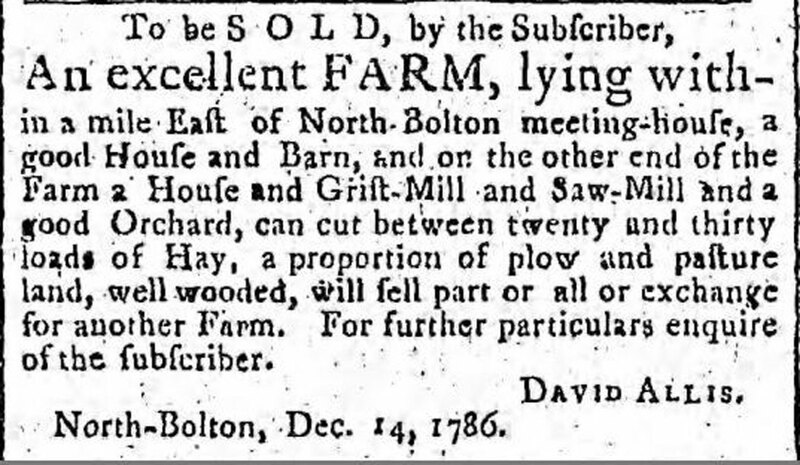 In 1786 he placed an ad in the Hartford Courant offering to sell the farm and mills. With apparently no interest he leases the mills and tenant house in 1788 to Samuel Bishop for three years. In 1789 David dies at age 69.
of the other family stones. David and his wife Sarah had eight children between 1742 and 1757 - all daughters. Thus David had no sons to help with the farm and mills or to inherit his property. The result was the breakup of his holdings. David did not leave a will, which is unusual for a man of his wealth and importance. The probate court assigned administrators to evaluate his estate and determine a fair division. The value of his estate was about £720. It was divided between his wife Heziah, his four married daughters and unmarried daughter Content. David was buried next to his wife and stepmother in the Old North Bolton Burying Ground, the only male Allis buried in Vernon. Then 160 years later his headstone vanishes to turn up in a Vernon Center patio in 2016. » Read about the recovery and replacement of David Allis' headstone. Nathaniel and David Allis were important members of early Bolton living in the northern section of town that would later become Vernon. Like many other early families whose descendants moved away their names and contributions have been forgotten. Bolton's 300th Anniversary is an opportunity to remember the Allis and other families who shaped the land and society in which we live today. Allis, Horatio D. Genealogy of William Allis of Hatfield, Mass and Descendants, 1630-1919. Good history of early Allis family. Alvord, Samuel Morgan (1920). A Historical Sketch of BOLTON, Connecticut. 29 pages. Short history of early Bolton written for the bicentennial. DePold, Hans (2008). BOLTON Historic Tales. 160 pages. Includes stories of the Revolutionary period. Kellogg, Allyn S. (1888). The Church of Christ In Vernon, Connecticut: An Historical Address. 50 pages. History and memories of the First Congregational Church by Kellogg (1824-1893), grandson of the first minister. Ronson, Bruce G. (1970). BOLTON's Heritage: Historical Sketches of Bolton, Connecticut. 220 pages. Edited by Ronson for The Bolton Historians. Includes a history of Vernon.